We love a range of fences including picket fencing, fence trellis and many others but many people do not put an effort of having such fences. We can make our garden fences more appealing as possible by the following simple means. We can paint our fences and stain them not only to protect and extend its life but to create a natural beauty. It also provides a colorful backdrop with a colorful pattern. Paints look wonderful on a garden fence. You can use designed pots for your fence. This includes traditional square pots and rounded ones for use with a wire mesh. You can create a vertical fence with a selection of flowerpot designs attached to the posts. Keep the pot palette designed and let your plants add color to them. You can make ordinary cans into fine art by painting them and then hang them onto the posts and grow flowers in them. Add some LED bulbs to it. This will provide a simple, stylish and elegant lit fence and for sure everybody will be attracted. You can also put up some candles on your garden fence to give a romantic feel. Traditional trellis adds structures to plants grown in the garden fences. This makes plants look beautiful and unique in its way. It also provides for better growth of the plants. Provide your fence with a shorter gate. This creates a welcoming entrance to your compound or garden. Use gravel boards to protect the barrier between the ground and your fence. This provides for long lasting fence as it prevents moisture damage and gives the fence a unique look. You can paint design flower arts from old metals and paint them in bright colors. Add them to your fence. Place old jewelry on your fence instead of getting rid of them. 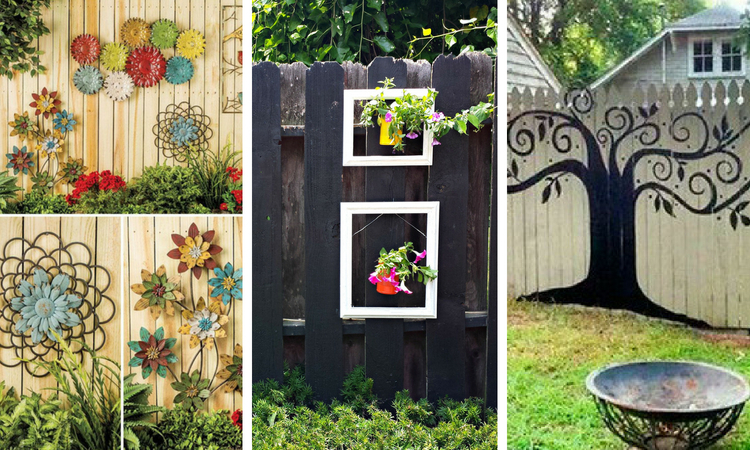 Add old patterned plates with a decorated display to your fence. Blend different styles and shapes and add climbing plants to finish its look.